I love animals, we have 4 dogs, 5 cats (we lost one about a month ago) and 3 tanks of fish. My latest dog is Sunshine. Someone dumped her in my yard and I kept her. She brought a ray of sunshine into our lives. Naturally all of my dogs and cats have been spayed or neutered. I have never let one of my pets have babies. It is not fair to bring them into this world, there are too many unwanted ones now. My kids and grand kids have even more dogs and cats. I am retired from BellSouth and I love gardening, reading, crocheting and more. My husband (he is retired from Lockheed) and I are also flea market vendors on the weekends. I love to read and have 9 book cases (floor to ceiling) packed with books. I do collect some authors and at times I somehow manage to get duplicates. When I get the duplicates or read books that I don't collect, I like to share. So, if you are a reader, check out my booth. I will be adding books periodically and you never know what you will find. Most of my books are first editions but occasionally I may list some that are not. I also list a lot of audio books. Thanks for dropping in and I hope to see you again real soon! BeewitchingBooks doesn't have any items in their booth! 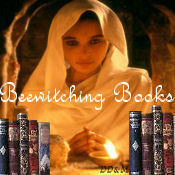 BeewitchingBooks has a wonderful book shop with great reads available to you! It can be a novel or a creative book in wonderful condition and you will be treated as a valued customer ! I would like to thank beewitchingbooks very much. She recently helped me out (newbie) alot, trying to find the value of an antique book. She guided me to right way. Thank you for your help!! has taken the time on several occasions to look at another Bonanzle memberâ€™s booth and then offer advice and a critique on how to improve it. This type of unselfish gesture on behalf of another member is laudable and much appreciated! Thanks again for sharing your time and talents! I popped in to check around and found awsome prices. June is a super seller and very organized. She has a great variety of items in both her booths and can be relied upon to do wverything inher power to satisfy her buyers. Shop and buy here with confidence.